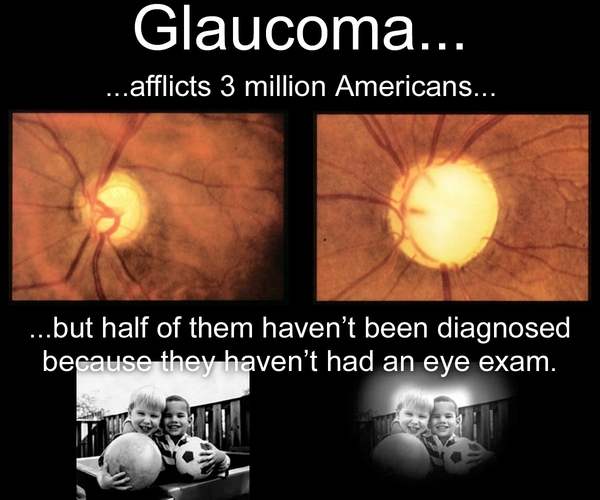 Glaucoma is a disease of the optic nerve - the part of the eye that carries the images we see to the brain. The optic nerve is made up of many nerve fibers, like an electric cable containing numerous wires. When damage to the optic nerve fibers occurs, blind spots develop. These blind spots usually go undetected until the optic nerve is significantly damaged. If the entire nerve is destroyed, blindness results. Because the eye is a closed structure, if the drainage area for the aqueous humor - called the drainage angle - is blocked, the excess fluid cannot flow out of the eye. Fluid pressure within the eye increases, pushing against the optic nerve and causing damage. Primary open-angle glaucoma is the most common form of glaucoma in the United States. The risk of developing primary open-angle glaucoma increases with age. The drainage angle of the eye becomes less efficient over time, and pressure within the eye gradually increases, which can damage the optic nerve. In some patients, the optic nerve becomes sensitive even to normal eye pressure and is at risk for damage. Treatment is necessary to prevent further vision loss. Usually, open-angle glaucoma has no symptoms in its early stages, and vision remains normal. As the optic nerve becomes more damaged, blank spots begin to appear in your field of vision. You typically won't notice these blank spots in your daily routine/activities until the optic nerve is significant damaged and these spots become large. If all of the optic nerve fibers die, blindness results. Closed-angle glaucoma - Some eyes are formed with the iris (the colored part of the eye) too close to the drainage angle. In these eyes, which are often small and farsighted, the iris can be pushed forward, blocking the drainage channel completely. Since the fluid cannot exit the eye, pressure inside the eye builds up rapidly and causes an acute closed-angle attack. This is a true eye emergency. If you have any of these symptoms, call your ophthalmologist immediately. Unless this type of glaucoma is treated quickly, blindness can result. Two thirds of those with closed-angle glaucoma develop it slowly without any symptoms prior to an attack. To schedule your next eye exam, please call 850-784-3936 or 850-763-2020 or go to the contact page.